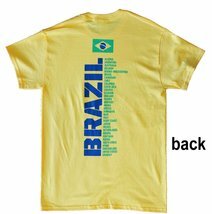 Celebrate the spectacle of World Cup Soccer in style!! These quality t-shirts are 100% cotton and have images on the front and back of the shirt. These t-shirts are available in adult and youth sizes.Brazil 2014! !